Dosa is Indian pancake cooked from a fermented batter prepared from grounded rice and black gram (Urad dal in Hindi). It is a thin pancake similar to a crepe in appearance. Dosa is fried from one side, and served with stuffing or without any filling. Dosa without any filling is known as PLAIN DOSA or PAPER DOSA. Traditional dosa stuffed with potatoes is known as MASALA DOSA. 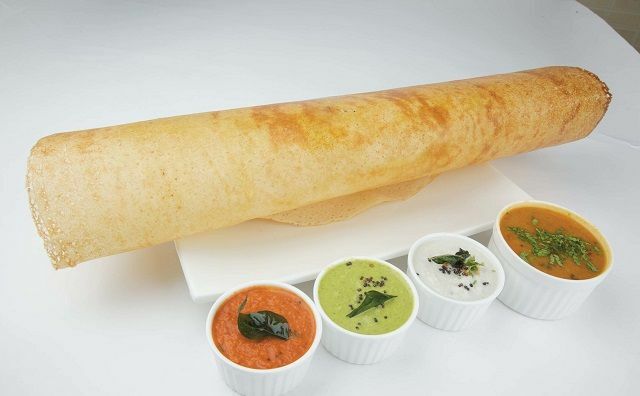 Today you can find more than 150 types of dosa which are served with variety of fillings. Dosa originated in Udupi town of present day Karnataka – a southern state of India. The original Tamil dosa was softer and thicker, but it has been modified to thin and crispier version to match the taste of India. This thin and crispy version in now globally popular recipe and found all around the world in every Indian restaurants. 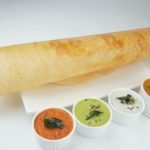 We are going to discuss here the preparation of the basic dosa recipe – PLAIN DOSA or PAPER DOSA, which is most important in cooking dosa. Only after mastering this recipe you can make delicious and crispy dosa with different filling of your choice. What kind of urad dal to use? Skinless black gram pulse (popularly known as dhuli Urad in Hindi language), either in whole or split form can be used. But split skinless black gram pulse is preferred. What kind of rice to use? Another important ingredient is rice – Dosa rice or Idli rice which is a short grained, coarse, parboiled rice that you can easily find in Indian grocery stores is required. Basmati or long grained fine quality rice does not provide desired result in fermentation. If you are not able to find idli rice, you can use any short grained, coarse, parboiled rice like parboiled sona masoori or parboiled ponni rice. The taste of dosa doesn’t get affected much with the rice but you may not get the desired volume of fermentation which is gained by using idli rice. What is the best ratio of black gram and rice for dosa batter? Preparing good idli or dosa batter is not difficult. For preparing batter rice quantity should be more than urad dal. To carry out batter fermentation at room temperature in the conventional way – make a batter having rice to black gram ratio of 2:1, 3:1 or 4:1. Determination of perfect ratio of rice and urad dal depends on the quality of these components. Based on the used quality of rice and urad dal, it needs experience to determine the perfect ratio. Don’t get confused, to always get a perfect dosa batter -use parboiled rice and split urad dal in2:1 ratio if you are not using fenugreek seeds along with it. This ratio always works without fail. Paper Dosa recipe (crispy, savory pancakes) from South India. You can have plain Dosa with Sambhar for lunch, dinner or breakfast on a vacation. It is consumed along with Sambhar, Coconut Indian relish, Groundnuts Chutney. Let us begin preparing Dosa. Wash and soak the rice and Udad Dal separately for 6-8 hours. Grind the Urad Dal to a thick consistency, adding water. You will know when to stop when you see the batter bubbling up a little. Mix the two batters stirring clockwise and anti-clockwise. Add salt and cover. Leave it to ferment overnight. Stir well, add water if the batter is too thick. Add salt if required. Prepare the non-stick pan by heating it. Grease the pan with a little oil. Spread the batter evenly on the pan. Cook the Dosa till one side is crisp and brown. Fold and serve hot with chutney and Sambhar. Chaat Masala Recipe that Will Spice Up Your Dishes!